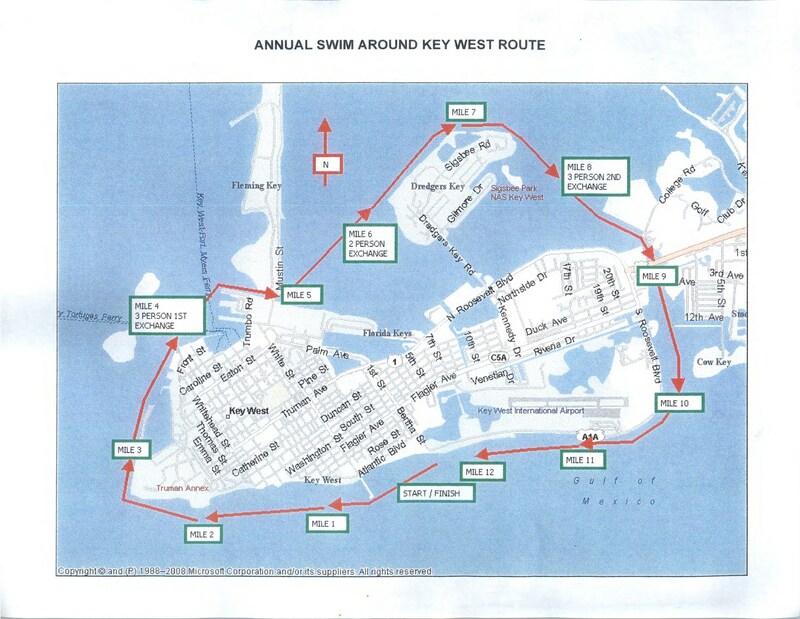 The Swim Around Key West is 12.5 miles, clockwise around the island of Key West. Course map. Click to enlarge. Each number represents a mile marker. First Wave Start: 6:15 a.m.
Second Wave Start: 6:30 a.m.
All Applicants Registration: 3:00-5:45 p.m. Mandatory Pre-race Meeting: 6:00 p.m. 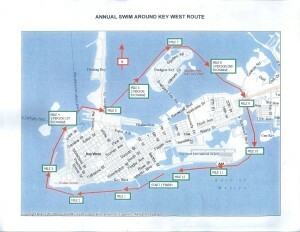 Welcome and thank you for your interest in the Annual Swim Around Key West (12.5 miles). Please carefully read all of the information provided in the various sections of our website. No Refund Policy: In the unfortunate case you need to cancel, there will be no refund of any application fees. In the unfortunate event we must cancel the swim there will be no refund of the application fees. Please don’t ask for a refund. No Waiting List: Once we cap a category, it is closed and there is no waiting list. Very Important Note: Our website previously listed a different start time from what you read here. We take our responsibilities very seriously. We revisited the tide chart and realized our error. Our event is tied to the tides. The high tide in the Key West Harbor on June 1, 2019, is at 8:54 a.m. We normally start the first wave swimmers 3 hours before high tide in the Harbor. Since the sunrise is scheduled for 6:38 a.m., twilight begins at 6:12 a.m. Based on these facts, we will not allow the first wave swimmers into the water until 6:15 a.m. This means that the traditional 30-minute start for first wave swimmers will be shortened by 15 minutes. The bulk of the swimmers and relays will begin approximately 2 hours and 30 minutes before the high tide in the Harbor. This is the traditional start time for this wave. If you have a rental boat and you cannot have your boat to the start area by 6:10 a.m. you must rent a kayak. No swimmer will be allowed to begin swimming without a support craft. This stipulation will have more bearing more on relay teams than solo swimmers. In almost every case, the solo swimmers choose to have a kayak for support. We have noticed that over the past several years, more and more teams are choosing to have a kayak in addition to the motor boat. This has never been mandated, but is certainly a good idea. This year, because of the very early start, you must make sure that you can get your rental motor boat to the start area by the time your wave begins. All rented kayaks are delivered to the beach so that should pose no problem. Rental motor boats, however, must be piloted to the start area. If you will be renting a motor boat, make sure you discuss all the pertinent details with the agency you rent from. If you cannot get your rental motor boat to the start area in time for your wave start, you MUST have a kayak to support the lead swimmer. The Annual Swim Around Key West has chosen to donate any profit after all our bills are paid to the Cross Country Team of the Key West High School. After last year’s event, we were pleased to be able to give this group a check for $4,300. Our hope is to increase this amount each year. You can download the entire 2019 race information packet here.